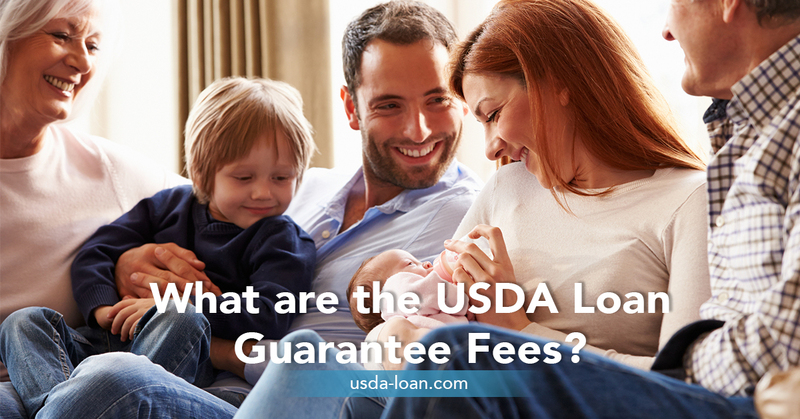 What are the USDA Loan Guarantee Fees? The USDA loan is a government sponsored loan program that helps low to moderate income families secure housing. This program began in order to help these families find housing that was safe and sanitary. The program has always offered a zero down payment program for these families. In order to keep the program running, there has always been the need to charge USDA loan guarantee fees. Over the years these fees have changed, but they have always been charged. As of today, the USDA loan guarantee fees are charged upfront and annually. The upfront fee is now 2.75% of the loan amount. This means that if you took out a $150,000 loan, you would owe $4,125 at the closing. The annual USDA guarantee fee is currently 0.50%. This amount is charged on an annual basis, but is equally divided amongst the 12 payments throughout the year. On the above $150,000 loan, the annual fee would be $750 per year or $62.50 per month. The amount gets automatically added to your monthly mortgage payment. In the above example, the difference would be: upfront fee $1,500 and the annual fee $525/year or $43.75 per month. This comes out to a $2,625 savings upfront for USDA borrowers with a $150,000 loan amount! Given the FHA insurance costs, you could see the savings. On the same $150,000 loan amount, a borrower would pay $2,625 upfront and $1,275 per year or $106.25 per month. Comparing this to the new USDA fees, the FHA costs are $1,125 higher for the upfront costs and $750 more per year. Combining the new guarantee fees with the flexible guidelines of the USDA loan, it shapes up to be a great alternative for borrowers that do not qualify for conventional financing. The credit requirements are fairly relaxed for this loan program as are the income requirements. In fact, the less money you make, the more likely you are to get approved for this loan program as long as your debt ratios are in line. Even the debt ratios are more relaxed than other programs, though, with a 29% maximum for your housing expenses and 41% for your total monthly expenses. If you can find a home in a rural area, as determined by the USDA and the census tract, you could secure very affordable financing with no down payment required. In addition, if you need help getting your closing costs paid, you can negotiate with the seller; ask the lender for help; or even receive a gift from someone close to you. The USDA guidelines are very simple and easy to qualify for as long as you fall within the income guidelines for your area. The USDA loan guarantee fees continue to fund the USDA program so the department can continue to guarantee these loans for low income borrowers. It is a great way to secure safe and sanitary housing without having to spend the rest of your life renting!